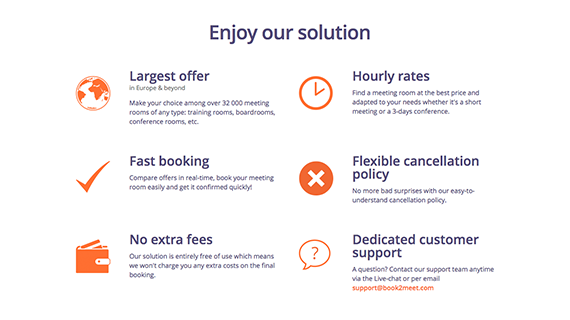 Book2Meet is the largest online booking platform for meeting spaces across Europe. It is a unique marketplace offering a wide choice of meeting venues from 32,000 small and convenient rooms in coworking spaces to midsize and large conference halls in Europe’s top business centers. Book2Meet addressed N-iX with an idea to create an easy-to-use platform for reserving the meeting venues across Europe. Apart from building the architecture of the application, full-cycle development and testing, N-iX specialists provided the UX and UI design. During the first two months together with the marketing team on the client’s side, we’ve conducted research and developed the project vision. Understanding the target audience of the platform, we aimed to keep the conservative design. Therefore, the original muted color palette delivered in the first iteration promoted the image of a booking platform for business needs. The first version of the design was tested with the opinion poll within the company. Whereas, next iterations were tested on special focus groups. The results of these experiments and extensive research allowed our designers to establish the bottlenecks in the customer journey and, ultimately, improve the user experience. Thus we minimized the number of clicks to make a user flow shorter. One of the challenges the UX designers faced was to place a number of the filters on the page without overloading the design. Also, we had to make sure it wouldn’t take a lot of time to set the search criteria. 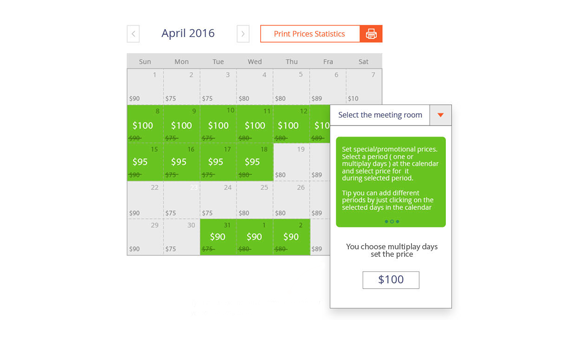 As a result, a user can book a venue staying on the same page. The platform enables search in the venues database. 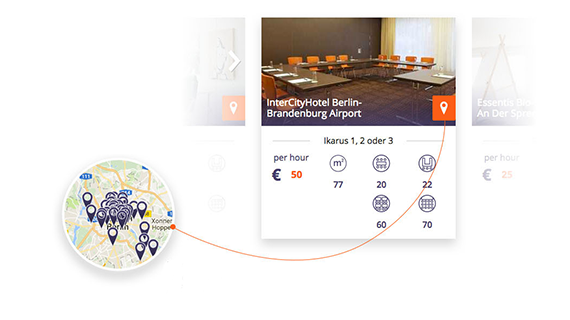 It offers filters to specify the venue details such as the price, the number of meeting participants, distance from the city center and room layouts (classroom, U-shape, etc.). Also, a user can choose what the space is to feature: Wi-Fi, a projector, a whiteboard, parking places, and so forth. At the beginning, the user journey included numerous options to choose from on three pages. In the last iteration, we’ve changed the headers and footers to optimize the platform for search engines. Our team also came up with the solution for finding the best matching results. Also, the used can choose between similar options near any of the supported locations which are suggested by the application. Additionally, we improved user navigation and modernized the UI design by introducing a number of features. For instance, we’ve added a hamburger button and changed the style of the main landing page. In addition, the latest design features a new logo, more rounded shapes, brighter images, and fresher colors. Agile approach and iterative design based on a cyclic prototyping, testing and in-depth analysis of the customers’ needs enabled us to release the platform in only 6 months. When Book2Meet addressed N-iX, their main goal was to build a solution that would facilitate meeting spaces reservation. They sought a reliable outsourcing provider with wide expertise in developing software solutions for hospitality businesses. We managed to gather a strong team of engineers who successfully tackled the technological challenges of the project and delivered a functional and intuitive application. N-iX specialists came up with seamless UX design enabling Book2Meet users to find and reserve a perfect meeting venue in just 5 minutes. In addition, our engineers developed a scalable software product using an innovative tech stack including Java, React JS, jQuery, Bootstrap, MongoDB, Amazon Web Services, Ruby etc. The search algorithm they developed ensured easy search and quick reservation which contributes to the success of the product. Thus Book2Meet has become the first pan-European booking solution on the B2C market.